Commodity prices and climate change press left a bad taste in the mouth for ExxonMobil, but are they game-changing events for the company? When a company is involved in a critical natural resource and is as large as ExxonMobil (NYSE:XOM), it's going to make the headlines an awful lot. For 2015, it was no different. While the company got its fair share of good and bad press, there were two headlines this year that really didn't look good for ExxonMobil: Oil prices and the investigation into whether or not the company misled investors about the risks of climate change. Let's take a quick look at these two things and how they could impact the company long term. Of all the headlines that have hit ExxonMobil this year, the ones that have had the greatest impact on the company's share prices have been the ones related to oil and gas prices. Even though the company has a vertically integrated business model that is designed to insulate the company's earnings from the typical ups and downs of commodity prices, this has been far from what you would call a typical year for oil prices. 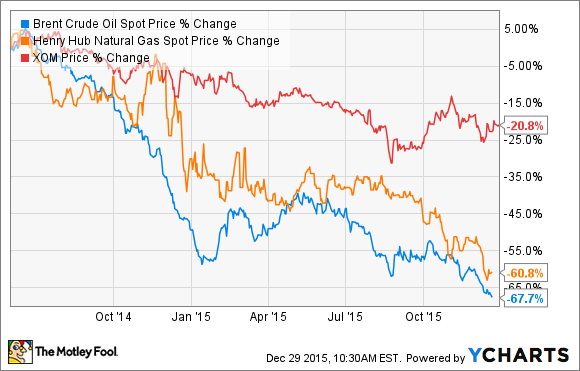 Over the past 18 months, the price of crude oil and natural gas have both fallen more than 60%. ExxonMobil has been able to stave off too much of that pain because its refining and chemical manufacturing segments have had some outstanding results as of late, but that doesn't help the fact that cash is getting tight, and management has needed to sell some assets and take on a little debt to meet its capital obligations. As long as oil and gas prices remain in the doldrums, chances are ExxonMobil's stock won't be going anywhere soon. It should be noted, though, that some industry executives are starting to see some of the initial moves that suggest a turnaround is coming. If low oil and gas prices weren't enough to deal with, this year, ExxonMobil grabbed a lot of headlines when the New York County District Attorney said it was investigating ExxonMobil about the possibility that it had misled some of its shareholders about the implications of climate change and whether the company's research into the topic was adequately communicated in its financial reports and other disclosures. The headlines for this event were pretty sensational, but when you get down to the nitty gritty of the case, it doesn't look like it could be a huge thing. Looking back at the company's annual reports and 10-Ks over the past several years, the company has given some sort of disclosure about the risk of environmental regulations, and more recently, it has specifically pointed out regulations related to climate change. That, more than anything, is the crux of the argument. ExxonMobil has disclosed that a major risk is regulations related to government actions that would incorporate climate change, but hasn't explicitly said that climate change in and of itself is a risk to the business. There hasn't been much about the case since the initial announcement back in early November, and not surprisingly, other stories have been released since that time, such as ExxonMobil's discussion with the Sierra Club back in 2008 about advocating for a general carbon tax rather than other cap-and-trade methods. Unless there is some sort of significant charge brought about by the New York Attorney's office that could result in large fines, chances are these climate-related news stories won't change ExxonMobil's business over the next couple of years. However, if government regulations really start to clamp down on carbon emissions over time, ExxonMobil may need to start thinking about a shift in its strategy. What is more pressing for ExxonMobil is keeping its eye on costs, especially on the upstream side of the business. Eventually, decline rates and a lack of investment will lead to high prices, and if ExxonMobil can keep its finances in order until then, then it should come out of this downturn a much stronger company.